Summary: Allison Weiss got her happy ending—a handsome husband, adorable daughter, a job she loves, and the big house in the suburbs. But while waiting in the pediatrician’s office, she opens a magazine to a quiz about addiction and starts to wonder…Is a Percocet at the end of the day really different from a glass of wine? Is it such a bad thing to pop a Vicodin after a brutal Jump & Pump class…or if your husband ignores you? When I sat down to write my review of ALL FALL DOWN by Jennifer Weiner, I realized that it's been thirteen years since her novel GOOD IN BED was published. Like many, I absolutely loved this book. I laughed and I cried, and I still look back on that novel as one of my favorites of all time. I've read all of Ms. Weiner's books since that first one, and I've been looking for one that evokes those same feelings in me. While I've enjoyed most of her books (some more than others), sadly, I haven't had any luck finding one that I've loved as much as GOOD IN BED. 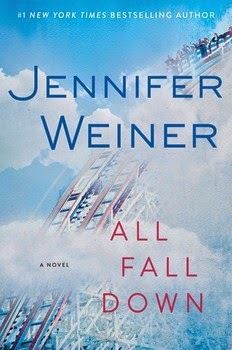 Ms. Weiner's latest novel ALL FALL DOWN came pretty darn close though. ALL FALL DOWN tells the story of Allison Weiss. Allison has a great job, is married to a good guy and has a gorgeous daughter. Life should be "perfect." However, Allison has a problem... and a pretty big one at that. She is addicted to prescription drugs. Allison has a lot of stresses in her life -- her husband is distant, her daughter is strong-willed, her father has Alzheimer's and her mother can't handle it -- so she just needs a little something to take the edge off. The problem is that Allison begins to require more and more drugs just to get through the day. Eventually, Allison can't keep her addiction a secret and it threatens to destroy everything she holds dear in her life. I really, really liked ALL FALL DOWN and critics seem to agree. Booklist and Library Journal both gave it starred reviews, and there are some great blurbs from some popular authors. I think one of the reasons for the praise is that ALL FALL DOWN will resonate with a lot of readers. I know it did for me. A few years ago, there was a local doctor who had a thriving practice and a gorgeous family. As far as my friends and I were concerned, she had it all. And then one day, a local news program reported that she was abusing prescription painkillers. Just like that, her life fell apart and she lost her medical license. It was so tragic and I wondered how it could happen to someone who was so smart and successful. In ALL FALL DOWN, Ms. Weiner created a very real character in Allison. She reminded me a lot of women I know and respect, and this novel gave me some insight into how someone (not all together unlike me) could become an addict. I not only appreciated her progression as an addict, but I also liked how Ms. Weiner delved into her recovery steps. I found her portrayal of Allison's time at rehab to be extremely realistic from her denial, to her snobbery, to her eventual acceptance and hard work. One thing I really enjoyed about ALL FALL DOWN was that, despite being a story about a very sad situation, it was really funny... in a dark way. I have to admit that I wasn't the biggest fan of Allison for most of the story -- probably because she exhibited the selfish behavior of an addict; however, I did appreciate the development of her character. What I did love about her character was the humor and sarcasm she displayed over and over again. This book was laugh out loud funny in some parts, and it did remind me a bit of GOOD IN BED in that aspect. ALL FALL DOWN would make an excellent book club discussion selection. I have a feeling that my book club would be a little judgmental about Allison, but it could still be interesting to discuss some other themes in the novel including marriage, care taking, parent/child relationships, love, lies, betrayal, addiction, recovery, guilt, appearances, and self-discovery. You can check out the specific questions here. I think ALL FALL DOWN is the best book Ms. Weiner has written for many years. Highly recommend to fans of Ms. Weiner and those who appreciate women's fiction. Thanks to Engelman & Co. and the publisher for providing a review copy of this novel. Wow! I've only read one of her books but I can't remember which one because it didn't stick with me. I think I need to try this one or Good in Bed. I had the same experience as Kathy, I read one of her books but it didn't stick with me. I might give this one a try. I loved Good in Bed too and after reading your review will definitely check this book out.